The 2017 Graduate Research Conference (GRC) at UMBC delivered on its theme, “diversity across disciplines,” with research talks, posters, and keynote speakers in areas from history to atmospheric physics. The event also celebrated and encouraged interdisciplinary research and creative achievement. GRC attendees mingle during a poster session. That’s exactly what happened at the GRC on March 29. In a panel highlighting work related to climate change, Marshall Washick, emergency health services, presented his proposed research on the relationship between tuberculosis and air pollution in South Africa, Alexandra St. Pé, geography and environmental systems, discussed her work on the under-performance of offshore wind farms, and Michael Battaglia, Jr., chemical, biochemical, and environmental engineering, addressed how urban heat islands affect the chemistry of tiny particles in the air. In another panel, Shawntay Stocks, language, literacy, and culture, described research utilizing critical race theory just before Chrissie Reilly, media and communication studies, discussed how the film Jiro Dreams of Sushi demonstrates complex relationships with consumption, with both talks touching on the session’s “media manipulation” theme. “Mechanical engineers and historians are here in the same room talking to one another,” said Dean Scott Casper, of the College of Arts, Humanities, and Social Sciences. “That is what is really exciting about today.” Casper encouraged students to use the opportunity to hone their communications skills, both by presenting their own work and observing techniques others use to share complex ideas in different fields. Dean Scott Casper discusses the attributes of a great presentation during his featured talk. In addition to the panels and microtalks, four students tested their communication skills by competing in the international Three Minute Thesis competition, where each presented a summary of her graduate thesis in three minutes. Janae Baptiste, chemistry and biochemistry, won second place from the judges and first place from the audience for her presentation on research in Michael Summers’ lab on Feline Immunodeficiency Virus, the cat version of HIV. Denise Williams, chemistry and biochemistry, took first place for her talk on the toxicity of quantum dots—luminescent nanomaterials with a wide range of potential applications—based on her research in Zeev Rosenzweig’s lab. She will represent UMBC at the Council of Southern Graduate Schools regional competition. Both Baptiste and Williams are Meyerhoff Graduate Fellows. Onimi Jademi, vice president of the UMBC Graduate Student Association, chair of the GRC planning committee, and a Ph.D. student in information systems, shares, “The GRC provides a platform for all graduate students, across all disciplines and at all levels and stages of research, to discuss and exchange ideas.” Interactions with faculty, staff, and students from every corner of the university are a major advantage of the event, she explains, offering unique feedback to developing researchers, artists, and scholars. 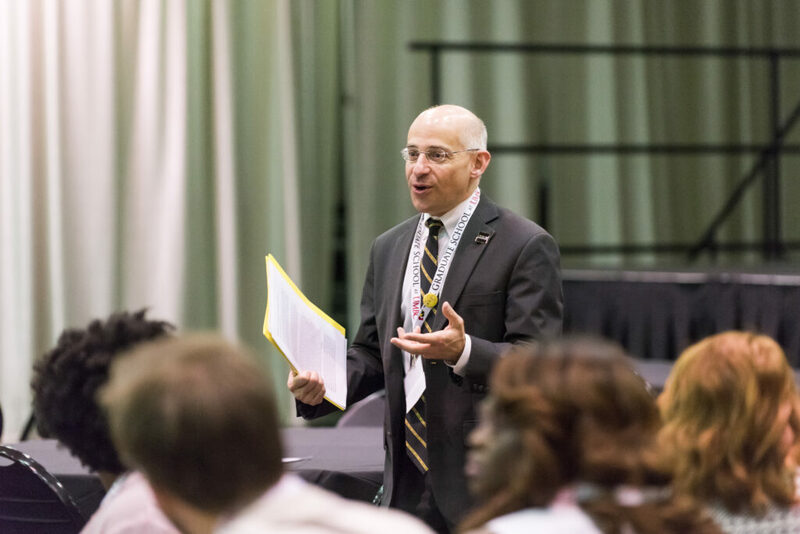 “GRC is not just a melting pot,” Jademi says, it’s an opportunity for graduate students to try out, retest, and “mold ideas and communication styles” that will help them connect with fellow researchers and the public throughout their careers. Banner image: Alexandra St. Pé answers a question about her research on wind turbines during a panel discussion. All photos by Marlayna Demond ’11 for UMBC.